A catalytic converter is a vehicle emissions control device which converts toxic by products of combustion in the exhaust of an internal combustion engine to less toxic substances by way of catalysed chemical reactions. The specific reactions vary with the type of catalyst installed. Most present-day vehicles that run on gasoline are fitted with a "three way" converter, so named because it converts the three main pollutants in automobile exhaust. The 3 main pollutants are carbon monoxide, unburned hydrocarbon and oxides of nitrogen. The first 2 are converted to 2 new molecules. This happens through an oxidizing reaction which converts "carbon monoxide (CO) and unburned hydrocarbons (HC)" to "CO2 and water vapor". The last pollutant is converted to 3 new molecules. This happens through a reduction reaction which converts "oxides of nitrogen (NOx)" to "CO2, nitrogen (N2) and water (H2O)". 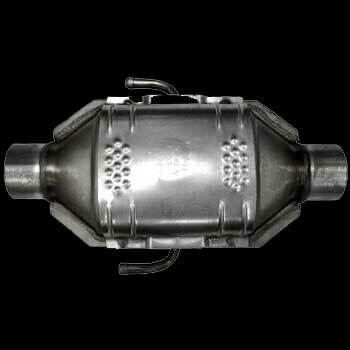 The first widespread introduction of catalytic converters was in the United States market, where 1975 model year gasoline-powered automobiles were so equipped to comply with tightening U.S. Environmental Protection Agency regulations on automobile exhaust emissions. These were "two-way" converters which combined carbon monoxide (CO) and unburned hydrocarbons (HC) to produce carbon dioxide (CO2) and water (H2O). Two-way catalytic converters of this type are now considered obsolete, having been supplanted except on lean burn engines by "three-way" converters which also reduce oxides of nitrogen (NOx). Catalytic converters are still most commonly used in exhaust systems in automobiles, but are also used on generator sets, forklifts, mining equipment, trucks, buses, locomotives, motorcycles, airplanes and other engine-fitted devices. They are also used on some wood stoves to control emissions. This is usually in response to government regulation, either through direct environmental regulation or through health and safety regulations.